When my auntie died last year, she left behind a little blue samurai fighting fish who lived in a murky tank by himself. He was a loner and a survivor, having gone days without being fed, and being ignored, as he swam in the dark waters of life all by himself. It was only a few months after my auntie's death that my cousin asked me if I wanted the fish, as she had two dogs and a cat, and the poor little fish was on the kitchen counter top, just another mouth to feed. So one day she delivered him to my house, and my mum said why don't you call him Angel, and so Angel came to live with me, the last living thing left of my auntie. Straightaway I cleaned his little hexagonal tank, and in the clear clean water I saw a beautiful bright blue fish with a tail like a gorgeous ball room gown. And so began my life with Angel. I would talk to him, feed him twice a day, watch him as he hid in the seashells at the bottom of his tank. He was shy and he liked to hide, other times he would dance in the water. Every night I put him to bed at 8.30, covered in an American flag tea towel, as he was only little and he needed to be put to bed early. In the morning he would be woken at sunrise, given breakfast, once a week I would clean his tank. Angel taught me it's the little things in life that count. Angel lived with me for six months. He was a good pet and the only successful pet I've ever had. Once I had a blue heeler puppy, but I had to give her away to the animal shelter when I couldn't find a home for us. Once I had a cat called Sooty but she was distressed living in a flat and went on to live with a lady who had a house and a garden. "I like to think he helped me with the grief I felt over my auntie. He taught me all living things must die one day." It was a Sunday morning when Angel died. At first I thought he was just resting, but after a few hours I realised he had died. Even Angels aren't invincible. I took him out of the tank and laid him on a paper towel, and then I gave him the funeral he deserved. Not a bin bag or toilet bowl, but the wide flowing river. I walked down to the Yarra and at a boat launch, I held him in my hand and stroked him and thanked him for being such a good little friend, and saying 'God bless Angel' I let him go into the water where he sank out of sight. Coming home, the first thing I saw when I opened my door was Angel's empty tank. It made me sad. With Angel I was never lonely, he gave me routine. If I talked out loud then I wasn't talking to myself, I was talking to Angel. Sometimes I would watch him for hours, my gender fluid fish. He's been gone a while now, I like to think he helped me with the grief I felt over my auntie, he taught me all living things must die one day. When I walk past the river these days I think how it flows with the soul of Angel. How his decomposing body returned to the food chain. For my next pets, I might get two exotic fish and call them John and Yoko, and they will keep each other company and me company and teach me about love. Peta Yowie is a Melbourne writer. Recent articles by Peta Yowie. 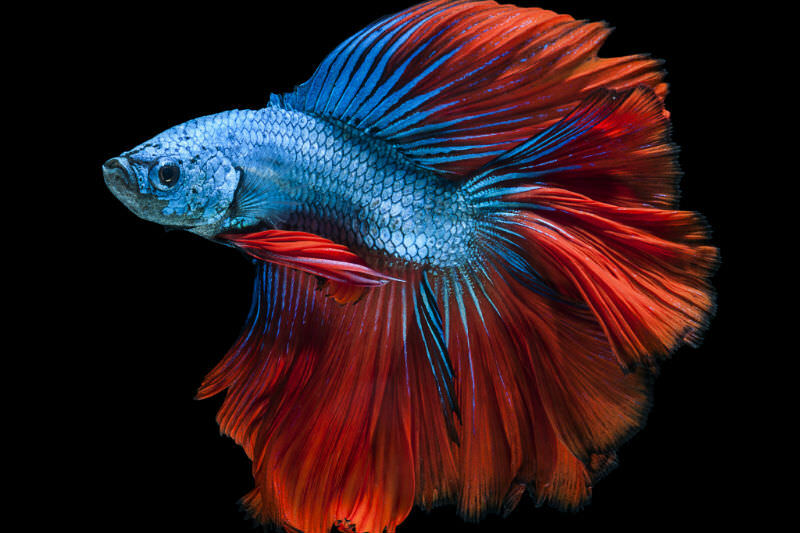 What a glorious creature, your blue samurai fighting fish. A loner and a survivor who taught you many things. I think it's a good idea to call your next pets John and Yoko. Just imagine. What an absolutely beautiful meditation. Just beautiful Peta.I learned a lot from Spike the crazy guinea pig who died before my eyes last summer because he refused to rest on a hot day. Peta, thank you for that lovely reflection on how God's creatures can touch us so deeply. Thank you Peta. I think I can sometimes sense the spirits of pets who have now left. They have all certainly taught me about death.